Industry analyst Michael Pachter blames the Infinity Ward blowup for a recent slip in Activision's share value and predicts that as many as 20 more employees could leave the studio over the next few months. Infinity Ward has been buffeted by a series of high-profile resignations since co-founders Jason West and Vince Zampella were canned by Activision last month. The studio has lost senior personnel including the lead environment artist, lead software engineer, a senior animator, a few programmers and, most painful of all, every lead designer who worked on Modern Warfare 2. 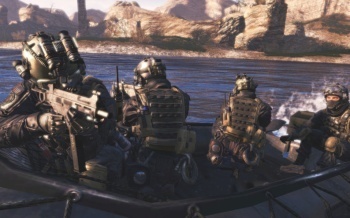 In spite of Activision's best efforts to remain nonchalant, the mass exodus appears to be taking a toll: The company increased its guidance for the fiscal quarter yesterday, thanks in large part to the release of the Modern Warfare 2 map pack, but its share price nonetheless dropped by nearly two percent. Analyst Michael Pachter believes the loss of Activision's prize horse may be making investors nervous and he doesn't think the bleeding will stop anytime soon. "We think that recent Activision share weakness has been compounded by additional departures at Infinity Ward which accelerated this week, and we expect another 10-20 employees to depart over the next few months," he said in an investors note. He doesn't expect the situation to take have much of a long-term impact, however. "The company will likely replace the departed employees with skilled developers," he said, "and while increased competition may impact sales of future versions of Modern Warfare, we expect the company to put out a competitive product."